I went out to the Hofley ranch on one of those days that the weathermen call “partly sunny”. They try not to mention “partly cloudy”. The ranch is south of Wilson, off Fall Creek road. 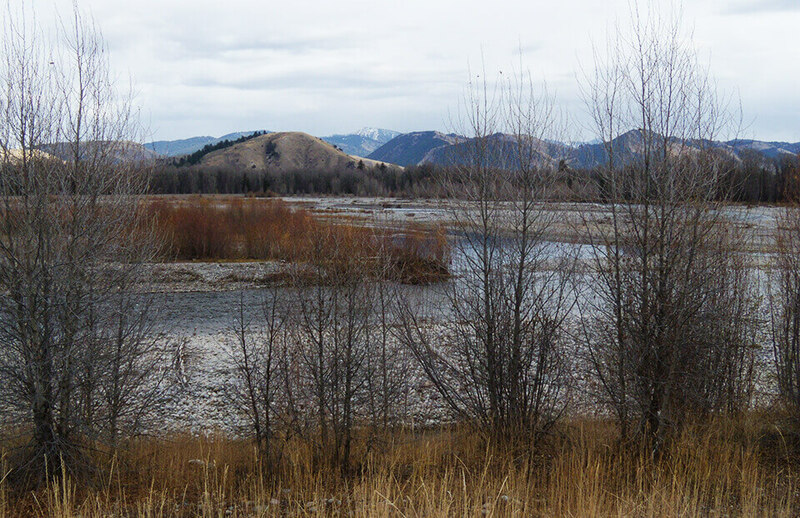 The area around the ranch would generally be considered riparian zone, because the Snake River and many small tributary streams cross through. Driving into the property, you can’t fail to notice the great old log barn that has been relocated from the White Grass dude ranch that operated in Grand Teton National Park until the 1980s. The barn has been restored and seems to be right at home at the Hofleys’. The land around the barn is a young cottonwood forest where the trees are spaced about 20 feet apart, so that you can see through them to the views encircling the barn. When the sun came from behind the clouds, the area looked like the enchanted forest with the old barn resting in a kind of deep repose, secure in its place. The warm hues of the barn were beautifully contrasted with the grey skies and the blue shadows on the ground. There were traces of the last snow on the ground, and the white traces provided speckled highlights in the scene. The ranch was very serene and peaceful and it was a great place to paint. My first effort featured the barn in an almost portrait portrayal, and didn’t describe the area very well, so I started again by raising the horizon line and placing the barn higher in the painting. Now the viewer can look past the trees to the barn and get a better feel for this peaceful, beautiful land. I think that the three whitetail deer that visited would have approved. This painting session is scheduled for September12th, 2013! Sign up to receive email updates from us to the right so you get our blog posts right in your inbox!